So I put out calls for my first R3 Zine last spring but as usual, work has taken over my art time! So now I am finally making the final last touches and I realized I still need a few more additions! 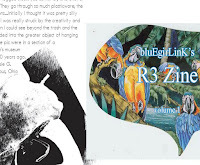 The focus of this Zine is the 3 R's Recycle, Reduse and Reuse and how it effects us as artists. If you have any examples I would love to include them. If they cant fit in this issue I will gladly put them in the 2nd issue!! I need them to fit in a small postcard size color or b/w. Drop me a note if you are still doing this. Would love to contribute though I think I am too late for this one. oh but I ahve started on round 2! Would love you to participate!! WOOT Awesome. What do you need from me? Can I email you directly and if yes where? Drop me a note at renmeleon@gmail.com when you get a chance. Looking forward to being a part of it!